This second cookbook from Leah Chase—now in paperback—contains reflections on life, business, family, and friends, with the recipes that bring them all together. There are special menus from organizations that have gathered at the Dooky Chase Restaurant in New Orleans for years, “off the menu” specials prepared for customers with special needs or a craving for something different, and a number of classic Creole and gourmet recipes, with every recipe guaranteed to warm the heart and nourish the soul. Recipes include her famous Gumbo z’Hab and Shrimp Clemenceau; new recipes, like the delicious Veggie Jambalaya and Rice Pancakes with Ham and Tomato-Basil Sauce; and old favorites, like Oxtail Stew and Sweet Potato Soup. Leah Chase’s influence does not end with her work at the restaurant. In 1997, she was presented with the New Orleans Times-Picayune Loving Cup for the hundreds of hours she dedicated to the New Orleans Museum of Art and other nonprofit organizations in the city. 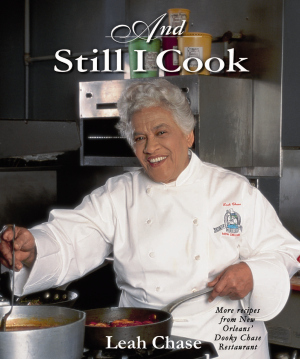 She was the recipient of the Southern Foodways Alliance’s Lifetime Achievement Award in 2000 and, in the same year, was presented with the Ella Brennan Savoir Faire Award for Excellence, conferred by the New Orleans chapter of the American Culinary Federation. In 2009, the Southern Food and Beverage Museum created the Leah Chase Louisiana Gallery in her honor. 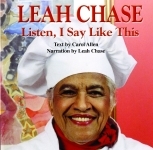 She is also the author of The Dooky Chase Cookbook and, in 2002, was the subject of a biography written by Carol Allen, titled Leah Chase: Listen, I Say Like This. Both are published by Pelican. amply demonstrates why Dooky Chase has ben a "must" for gourmets visiting the Crescent City.